At times of low lunar illumination, it can become increasingly difficult to discern regions of clouds and snow in the Suomi/NPP day/night band, shown above, toggling with the brightness temperature difference. Nevertheless, careful perusal of the image reveals cloud edges over northeastern Wisconsin and through central lower Michigan that are confirmed by the brightness temperature difference field. In contrast, the whiter region that stretches southwestward from Des Moines towards extreme northeastern Kansas has no signal in the brightness temperature difference field. This is snow on the ground (vs. little snow to the northwest). IFR Probability fields and GOES-Based brightness temperature difference fields are produced to aid in the detection of low clouds. In the animation above, higher IFR probabilities are centered on north-central Wisconsin where, intially, IFR conditions are not quite met (according to the plotted observations of ceiling and visibilities). However, as the night progresses, ceilings lower and visibilities decrease as IFR conditions do develop in regions where IFR Probabilities are high. The IFR probabilities roughly overlap the region where IFR conditions exist. Note that encroachment of higher clouds in from the west, starting around 0800 UTC, means that satellite data cannot be used in the IFR Probability algorithm. Because only model data are used, IFR probabilities drop from values at/above 80% to values between 50 and 60% even as IFR conditions come to be more widespread. For this reason, it is important when interpreting IFR Probabilities to be alert to the presence of high clouds. IFR Probabilities give a much more better approximation of where fog/low stratus may be occurring than a simple brightness temperature difference field. The toggle between the GOES-R IFR Probabilities and the GOES-13 Brightness Temperature Difference, below, gives testimony to this. This entry was posted in Day/Night Band, Midwest, Suomi/NPP on December 27, 2013 by Scott Lindstrom. High clouds in the atmosphere limit the ability of satellites to sense the presence of low clouds, as this example from December 16 2013 on the coast of Oregon demonstrates. Both the brightness temperature difference product and the water vapor imagery show signatures that accompany high cirrus. When cirrus is present, the brightness temperature difference field cannot be used to isolate regions of fog and low stratus because the satellite is detecting radiation from the highest emitting surface (the cirrus) not the fog/low stratus beneath. The IFR Probability field, however, uses both cloud information and Rapid Refresh Data, and the model data can fill in regions where satellites give no useful information, such as the lower Columbia River Valley around Astoria. Because satellite data are not used as a predictor, probabilities are lower. Remember how the presence of high clouds affects things when you interpret the IFR Probability fields. GOES-R Cloud Thickness is not computed under high clouds. The GOES-R Cloud Thickness is the thickness of the highest water-based cloud deck. If a cirrus deck is present, or if twilight conditions are present, GOES-R Cloud Thickness is not computed. This entry was posted in Cloud Thickness, Pacific Northwest on December 16, 2013 by Scott Lindstrom. 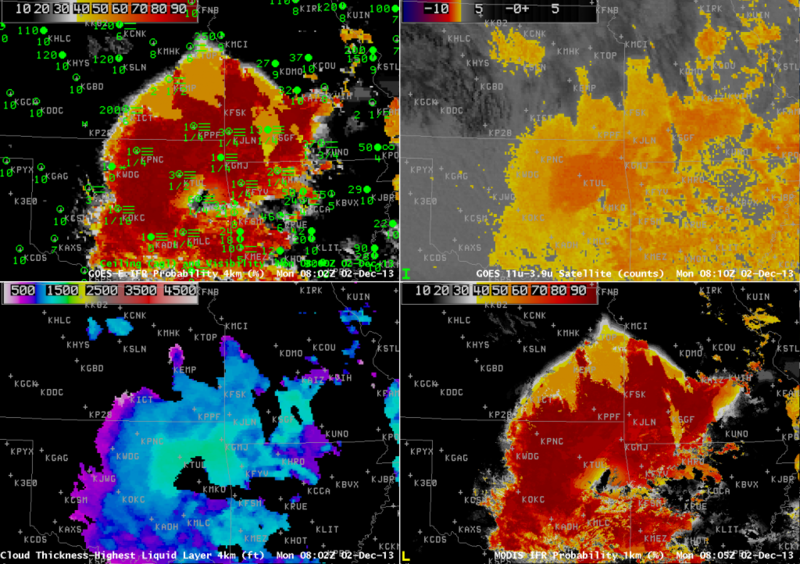 The traditional (or heritage) method of detecting fog/low clouds is a brightness temperature difference (BTD) product. The difference between brightness temperatures at 10.7 µm and 3.9 µm highlights water-based clouds because those clouds do not emit as a blackbody at 3.9 µm, so the inferred temperature (computed assuming a blackbody emission) is colder than that temperature computed using 10.7 µm radiation, because clouds emit radiation at 10.7 µm more like a blackbody. At night, the GOES-R IFR Probabilities use a pseudo-emissivity at 3.9 µm in lieu of the 3.9-11µm BTD to highlight regions of water-based clouds at low levels. 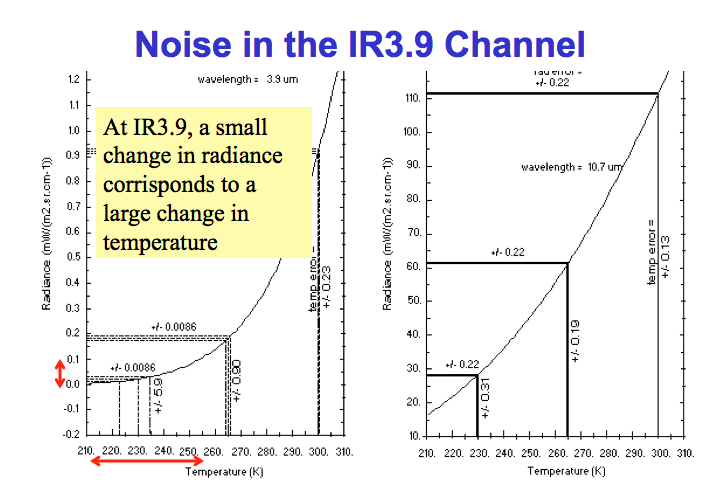 The 3.9 µm Pseudo-emissivity is the ratio of the observed radiance at 3.9 µm to a computed 3.9 µm blackbody radiance that is based on the observed 10.7 µm brightness temperature. In other words, the observed 10.7 µm brightness temperature is computed from the 10.7 µm radiance. That computed brightness temperature is then used to compute a 3.9 µm radiance that would be detected if the emitter was a blackbody. The 3.9 µm pseudo-emissivity produces a satellite signature for low water clouds similar to the brightness temperature difference but is used instead because it is less sensitive to scene temperature. Skill scores for fog/low stratus detection are higher when the pseudo-emissivity is used in the algorithm to find regions of low clouds/fog than when the brightness temperature difference field is used. This entry was posted in Emissivity on December 9, 2013 by Scott Lindstrom. Dense advection fog developed in the upper midwest on Tuesday 3 December 2013 and persisted into December 4th as a Colorado Cyclone moved into central Wisconsin, drawing moist air over cold ground. The IFR Probability Product, a product that fuses together the 3.9 µm pseudo-emissivity (nighttime only) from satellites (a signal similar to the 3.9-11 µm brightness temperature difference field, which gives little information on low clouds in this situation) with model data from the Rapid Refresh (which suggests widespread fog), accurately depicts the large region of advection fog that led to dense fog advisories over parts of Wisconsin and Iowa and surrounding states (see below). The dense fog was present late in the day on December 3rd, 2013, and the IFR Probability fields reflected that. However, in the image above, there are isolated pixels with very low probabilities mixed in with the high probabilities over Wisconsin and surrounding states where advection fog was widespread. Why? This storm had multiple cloud layers, which can make detection of low cloud difficult from satellite (above) when sun angles are low (sunrise/sunset). The IFR Probability image above is at 3:45 PM local time, and the sun is low in the sky. Deep shadows are being cast and the dark shadowed regions in the visible are misinterpreted by the cloud-clearing algorithm as clear skies. 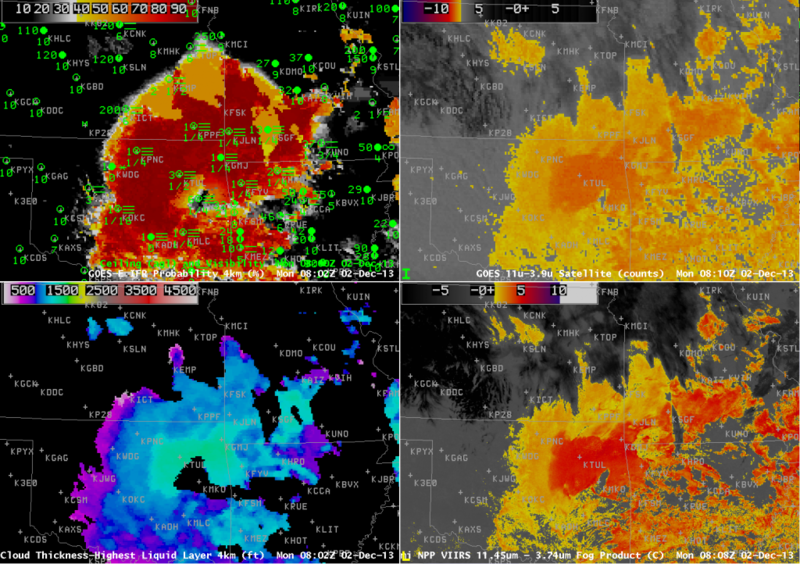 During the day the GOES-R fog/low stratus algorithm relies on the cloud mask to determine where clouds are. Where clear skies are detected (erroneously, in this case), IFR Probabilities are not calculated because fog/low stratus are not expected to be present. Thus, if you see pixelated fields such as the one above, and the sun is low in the sky, this likely means cloud shadows are causing the cloud mask to erroneously return clear sky, which in turn leads to very low IFR probabilities. 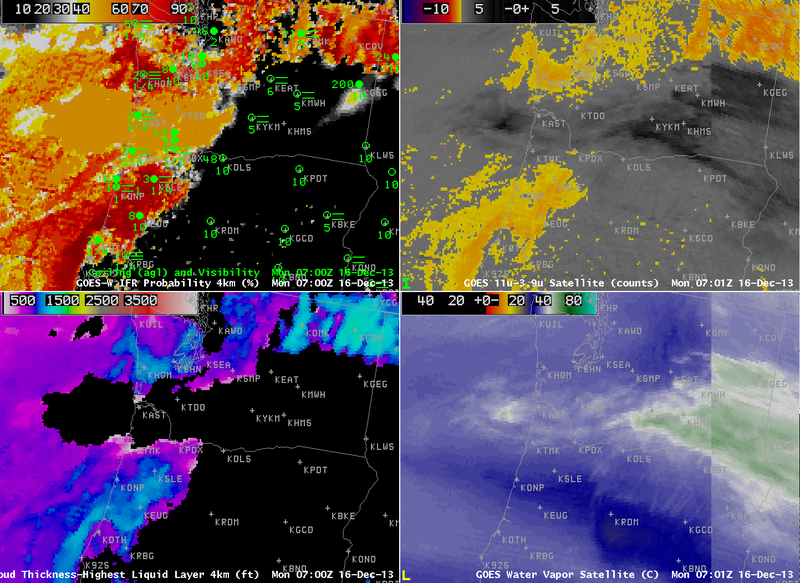 The animation below cycles through IFR Probability and visible imagery (with a regular enhancement and with a low-light enhancement). After sunset, the cloud shadows are gone and the probability field fills in (as can be seen in the 0215 UTC imagery at the top of this post). This entry was posted in Error Explanations, Midwest, Multiple Cloud Layers on December 4, 2013 by Scott Lindstrom.